(Nanowerk News) Ancient memory devices such as handwriting were based on mechanical energy—but in the modern world they have given way to devices based generally on electrical manipulation. Today, scientists from the RIKEN Center for Emergent Matter Science may be about to wind back time. In a study published in Nature Communications ("Uniaxial stress control of skyrmion phase"), they have found a way to manipulate skyrmions—tiny nanometer-sized magnetic vortices found at the surface of magnetic materials—using mechanical energy. 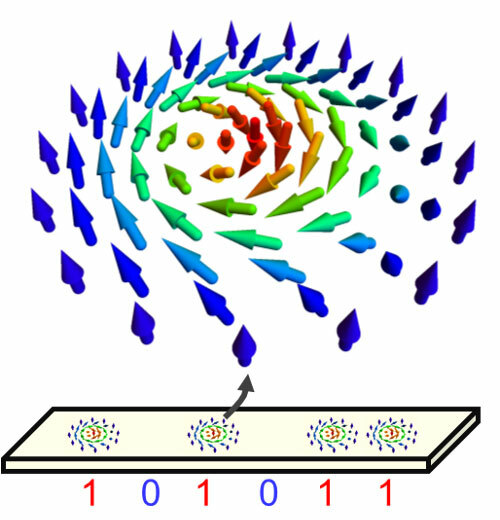 Next generation magnetic memory based on magnetic skyrmions. 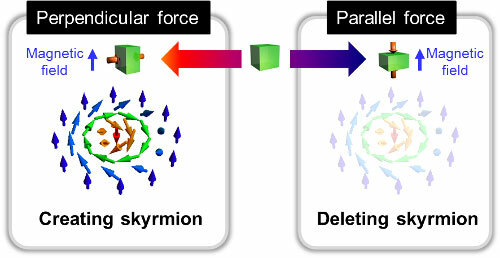 Creating and deleting skyrmions using mechanical stimulus.